How does God speak to us, if burning bushes aren’t a normative experience? In answer to this question, we’ve considered Scripture, Tradition, and Reason, but could God also speak to us through our own experiences and the experiences of others? The idea that God might speak through experience is both an attractive and dangerous idea, but can faith be alive if it’s not experienced? When will I come and see God’s face? (Psalm 42:1-2 CEB). According to Augustine and the Psalmist this desire to be in relationship with God is written into our very being. We won’t rest until we find our fulfillment in God. Many years ago, I “converted” from being an Episcopalian to being a Pentecostal. There were a number of reasons why I did this, but ultimately I was looking for a deeper and richer spiritual experience than what I was finding in the church of my birth. Although I had been the church my whole life, and had been an acolyte, a choir member, and a lay reader, in my heart I knew there must be more. I eventually left Pentecostalism for the Disciples, because I wanted a more balanced spirituality that honored heart and mind, experience and reason. But the point is, I was looking for a living faith. Jeremiah speaks to this concern in his word concerning the new covenant that God will make with Israel. Unlike the earlier covenant that was written on tablets of stone, this new covenant will be written on the heart. When this happens, we will no longer have to teach each other about God, because everyone will know the LORD (Jer. 31:31-34). And as the Psalmist puts it: “Those whose heart is right will see God’s face.” (Psalm 11:7). As we ponder this question of how we can hear the voice of God, another question emerges: Is experiencing God’s presence the desire of our hearts? If it is, then what are the markers of this experience? Can we not say that the clearest marker of our love of God is found in the way we love our neighbor? You might be wondering – where does Acts 11 fit into this conversation? Well, I chose it because it speaks to how the Spirit can use our experiences to awaken in us an awareness of the presence and purpose of God. According to Luke, when Peter returned to Jerusalem after his visit to Cornelius, he faced a lot of questions from a congregation that still itself as a renewal movement within Judaism. They asked him – so why did you enter the home of the uncircumcised and eat with them? They lacked a vision of where the Spirit might be leading them as a movement. Their question then was this: by what authority did you baptize these uncircumcised Gentiles? Peter answers by telling them the story of his own experience. He tells of his vision and the invitation he received from Cornelius, a Roman soldier and worshiper of God, to come and share the gospel of Jesus with his extended household. 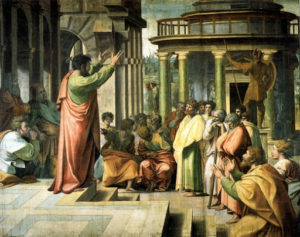 Although he might have gone reluctantly, he went anyway, and has he preached, the Holy Spirit came upon them, and they began to speak in other languages – just like on the Day of Pentecost. Whatever doubts he may have had melted away as he watched the Spirit fill this group of people, and therefore, he concluded – how can I not baptize them. After all, didn’t John the Baptist say that even as he had baptized with water, so Jesus would baptize with the Holy Spirit? If these people were good enough for Jesus, then surely they were good enough for the church. The Spirit had spoken, and the dividing walls came down – even though he didn’t have a scripture, a tradition, or even a good rationale for doing this. But, from then on, at least in theory, this would be a church that included Jew and Gentile, slave and free, male and female (Gal. 3:28). Of course, even if the Spirit takes down walls, we’re very adept at building our own walls. But, thankfully God doesn’t give up, and so even if we build walls, God continues to use our experiences of faith to break down these walls. One of my favorite stories is that of Aimee Semple McPherson. Back in the 1920s Sister Aimee broke onto the American scene and gained fame as a preacher. Her critics demanded to know why she thought she could preach. After all, Scripture seemed clear: women are supposed to keep silent and refrain from teaching men, so why did she think that she was different? Why did she think that she could subvert Scripture and 2000 years of tradition and stand in the pulpit and preach? She answered this question by appealing to her experience. The Holy Spirit had gifted and called her to preach, so what else could she do? This sense of calling gave her the confidence she needed to preach, in spite of the opposition that she experienced, and as a result she became one of the best-known evangelists of her day. She did this long before most Disciple churches, including this one, allowed women to be elders or preachers. But experience can be rather mercurial. You have to be careful about what you think God might be saying. After all, lots of people have taken the wrong turn because they trusted their gut over Reason or Scripture. Although there are dangers to be avoided, Disciples theologian Kris Culp makes a helpful point: “Experience will not offer us unambiguous perceptions, whole truths, or pure touch points of the holy” Chalice Introduction to Disciples Theology, p. 71). What it does is open our eyes to new movements of the Spirit, by disrupting old ways of doing things and by raising questions of faith that we must address. She points us to the story of Frederick Douglass, one of the most important abolitionist voices in American history. Douglass spoke out against the evil of slavery, not because it was the popular view in the surrounding culture, or because religious leaders had spoken against it, or even because he had read it in Scripture. No, it was his own experience of slavery that told him that slavery was evil, and that he should do everything he could to end slavery in America. I think we are at a similar moment in time when it comes to the question of homosexuality. Those who argue against the full inclusion of Gays and Lesbians in the church will point to Scripture, the traditions of the church, and even nature as evidence against allowing gays and lesbians to take positions of leadership in the church, being married, and being ordained. But is this a Cornelius moment when the Spirit is ushering in a new age? And if so, what does this mean for the church? Although I haven’t had a vision like Peter’s, my experience has led me to believe that God may be doing a new thing. Now, I’m not prepared to go too deeply into the discussion this morning, but I do have something to share. Like many Christians, I once believed that both Scripture and the traditions of the church barred the full inclusion of homosexuals in the church. That was, until my brother, who at the time was a Young Life leader and a committed Christian, came out as a gay man. That revelation led me to re-evaluate how I read Scripture and church tradition. I concluded that God was opening the door of inclusion, just as God had done for the Gentiles in Acts 11. Since I began this journey with the Spirit, I’ve met many other gay and lesbian Christians, who seek to be faithful followers of Jesus. They give evidence in their lives of strong character and deep spirituality, as deep as I’ve found in any straight Christian. I know that not everyone is at the same place as I am, but this is where I find myself, and the reason I’m here is rooted in my experiences. So, is experience revelatory? By itself, I’d say no. Experience can, as they say, provide false positives. But, there are ways for us to discern whether God is speaking to us through experience. We can compare our experiences with those we find recorded in Scripture and Tradition, and ask if this experience is reasonable. Together, as we listen for the voice of the Living God, who continues to speak to us in the here and now, we will find the answers we’re looking for. And in the end we return to St. Augustine’s point: “Thou hast made us for thyself and restless is our heart until it comes to rest in thee.” Yes, ours is a living faith, a faith that includes both minds and hearts, a faith that is growing and evolving even as we seek to walk in the presence of the Living God, who has made us for this purpose.